Recently, I penned an article called “The Most Worthless Program in Your Safety Manual.” One of the comments made a reference to personal responsibility, and its role in preventing accidents. The purpose of the article was not necessarily to absolve human involvement with respect to incidents, it was to highlight that we choose to place the blame for incidents on humans when many times there are a number of causal factors outside of their control. In a just culture, the responsibility is shared between those who design and implement, / and those who maintain the system. It does not require any imagination to point a finger at the last line of defense, especially when it fails in a system and an incident occurs. To single out and discipline the person is disingenuous, and for some reason as a profession we can’t seem to get past that. As safety leaders, we are (justifiably) concerned with the management of safety and safe operations, but in our shared accountability model there are some areas where people need to remain personally accountable. 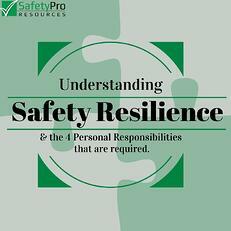 In fact, there are four specific responsibilities that safety leaders should endeavor to develop in line and supervisory personnel. The rationale to developing these particular aspects from an organizational standpoint is to benefit from building resilience in the organization. An organization can operate with bad policies, procedures, and rules for quite some time without incident. This can be attributed to the resilience of the line personnel. In other words, by having resilience in our human capital, organizations can operate safely despite an ineffective safety program. As safety leaders are aware, nothing can be as dangerous as a little knowledge. Combined with a higher-than-average risk tolerance, this is frequently where we see incidents / near misses. However, as that knowledge increases, the safety and efficacy of operations increase. We can help move this process along in individuals. Einstein described himself as “passionately curious,” and attributed his success to this. If personnel don’t come with a sense of curiosity, develop it. This underscores the importance of employee engagement and a learning organization. Curiosity can also be augmented with a sense of purpose and achievement, which is elicited by setting (and holding personnel accountable for) goals. The organization is responsible for aligning competencies with its needs and aspirations, but the onus of responsibility for developing that competence falls on the individual. Development of an occupational skill set builds several other skills which are universally important in the workplace setting: confidence, mindfulness, and self-discipline. These skills are necessary for nearly every position in the workplace, and exceed the minimum framework that is needed by the organization to ensure that work is being completed safely and efficiently. Resourcefulness is the big part of this aspect, not just in terms of knowing how to deal with situations when uncertainty is involved, but also in the ability to track down information. Knowing when to ask a question is important and perhaps over-emphasized with compared with knowing where to find the answer to a question. This may be a local resource, or it may even be part of a social network. The development should be proactive. Part of resilience is being able to absorb infrequent or abnormal system events without interruption, so the other critical piece here is having the flexibility and resourcefulness to be able to play a positive role in case of an emergency. This is closely tied to emergency response roles, but individuals (as part of teams) that are able to mitigate consequences of these types of events, have to be able to function appropriately and effectively when it counts. This is an area that I think people who have many interests tend to short cut themselves, and in doing so lack the consistency necessary for their co-workers to see them as dependable. People can become interested in fads, different aspects of a career, or lack a sense of purpose. Often times this translates into a perceived lack of effort, even though that may not be the case. As safety leaders, it is important to understand how personalities can affect people’s perspectives particularly when it comes to safety.